Roger Goodell deflategate ruling: Why the NFL commissioner’s Tom Brady ruling might end in him finally losing his job. 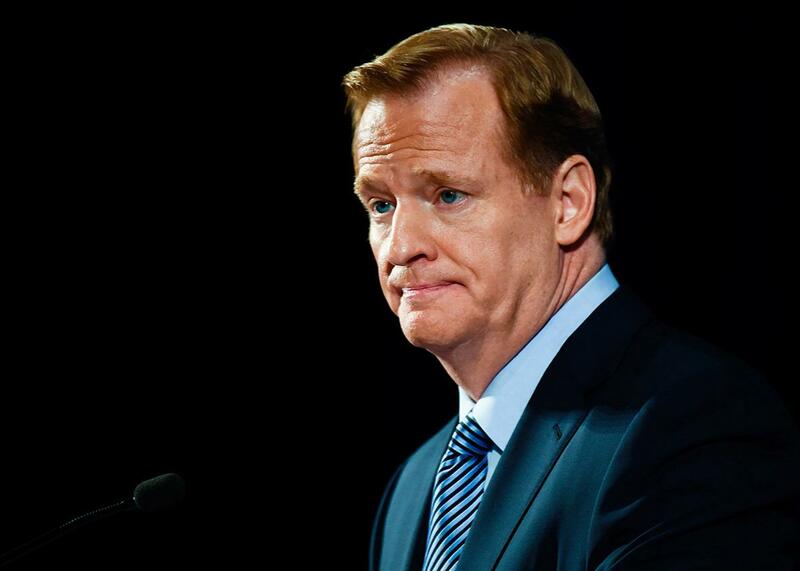 Why the NFL commissioner’s latest disaster might actually be his undoing. He may appeal, but that doesn’t mean he’s appealing: NFL Commissioner Roger Goodell speaks during a press conference on Sept. 19, 2014, in New York City. After the latest extraordinary unraveling of Goodell’s kingdom, he probably wishes he could have that moment of ridiculous preening back. On Thursday, U.S. District Judge Richard M. Berman negated the NFL’s four-game suspension of New England Patriots quarterback Tom Brady for his alleged role in a conspiracy to deflate footballs during last winter’s AFC Championship Game, that last bit being a hilariously stupid string of words that NFL fans have not-so-hilariously heard repeated incessantly in some variation for close to eight months. This period witnessed a lengthy “independent” investigation (withering scare quotes courtesy of the Honorable Judge Berman), which, apart from Brady’s draconian suspension, resulted in a seven-figure fine and the loss of draft picks for last season’s Super Bowl champions. All of this was done for the purported purpose of protecting the fairness and integrity of a league that includes a team whose name is a racial slur. The decision seems obvious, but the overturning of the suspension is still a stunning development, the latest embarrassment for a commissioner and league that are mired in an unprecedented crisis of confidence. Goodell should have been booted from his perch atop the richest league in all of sports long ago, but this latest cataclysm might finally serve as the impetus for that to happen. In a less damaged NFL world, a number of things would be working in Goodell’s favor despite this setback. For starters, the Patriots are an immensely dislikeable team, and I say that as someone who roots for them. They’ve been caught cheating in the past, and they were caught cheating back in January—this much is not even challenged by Thursday’s ruling. And Brady probably knew about it and encouraged it—this much is at least very likely. Yet Berman’s ruling was largely met not with outrage at a miscarriage of justice, but a spasm of relief that sanity had prevailed. From a moral standpoint, there are absolutely no winners in this decision and yet somehow there is something like justice. That fact alone is as withering an indictment of the ongoing disaster of Goodell’s NFL as any I can imagine. In retrospect, that Sports Illustrated cover was the high point of Goodell’s career; nearly everything since has been humiliation, so much so that the glowing man in that photo now seems like an unfunny parody. When it’s all said and done—which will probably be soon—the Goodell tenure will be the story of a man obsessively buying into his league and sport’s self-mythology at the very moment its audience and players were buying out of it. Goodell and his enablers have always confused power with rightness and vice versa, a common affliction of those born on the winning side of capitalism. Now a court of actual law has rendered Goodell powerless, which means the clothes will likely soon be seeking a new emperor. This has been a long time coming. In early 2012, Goodell handed down historically severe punishments in the wake of the New Orleans Saints’ “bountygate” scandal, suspending the team’s head coach, Sean Payton, for a full year, and defensive coordinator Gregg Williams indefinitely. He also suspended four Saints players a total of 31 games, a remarkably harsh punishment vacated in December of 2012 by former Commissioner Paul Tagliabue. (That ruling was cited repeatedly and favorably in Berman’s own decision.) By that point the player suspensions had already mostly been served, and the Saints—who’d finished the 2011 season 13–3—were on their way to a 7–9 record. At the time this should have been a bigger deal than it was: After all, the NFL’s former commissioner had just publicly declared that its current commissioner had drastically overstepped his bounds in a decision that destroyed the season of one of the league’s best teams. But the mainstream NFL press had largely cheered on Goodell during bountygate, hailing it as the commissioner getting tough on safety in a league battling the growing stain of the chronic traumatic encephalopathy crisis. People overlooked the immense flaws in the league’s investigation and adjudication processes; the widespread off-record whispers that the Saints were being scapegoated; the extremity of punishments that seemed almost preening in their harshness; the stance of detective-judge-executioner that Goodell struck so smugly, and ultimately unconvincingly. All of this has happened on Goodell’s watch. As atrocious of a commissioner as he’s been, though, I’m not entirely sure how much of each ensuing disaster is really his fault. The head injuries, the violence that bleeds so indiscriminately between on-field life and off, the tone-deaf jingoism, the retrograde attitudes toward anyone who isn’t a parody of Christian hetero masculinity: at root none of these are Roger Goodell’s doing, even if they’ve become his burden. Taken at long range, the NFL doesn’t have a Roger Goodell problem so much as it simply has a football problem. But one game at a time, as they say, and deflategate should be Goodell’s last. This self-inflicted debacle was just his latest and greatest bridge too far, made all the more obvious—as Deadspin’s Tom Ley pointed out on Thursday—by the ridiculousness of the initial cheating scandal itself. Goodell suspended Tom Brady four games for possibly knowing about deflating footballs because to his uncreative mind this was the most pressing way to protect his league’s integrity, which has proved once again to be his least reliable imaginary friend. But really he did it because he thought he could, until it turned out he couldn’t. In a sport that still worships at the altar of force, it’s pretty clear where that leaves him.